When my mate Dan asked me if I wanted to go and see Joe Brown talk about the first ascent of Kangchenjunga, I didn’t even realise he was still alive (Joe Brown that is, not Dan). There aren’t many climbers from the golden age of Himalayan mountaineering in the 1950s, when nearly all of the world’s 8000m peaks were climbed for the first time, who are still with us. George Band, Joe Brown’s climbing partner on Kangchenjunga in 1955, passed away last year, as did the great Walter Bonatti, who was part of the controversial Italian team who made the first ascent of K2 in 1954. 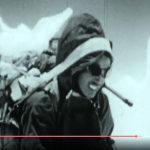 Mike Westmacott, the last surviving British member of the successful 1953 Everest expedition, died in June this year, and I understand that Topgay Sherpa, the last Sherpa member of that expedition, died in Darjeeling last week. For a working class lad from the suburbs of Manchester whose only job had been as a plumber’s apprentice, Joe Brown broke the mould. His invitation to join the team was a big surprise, but richly deserved. When he opened Charles Evans’ letter, he said he felt like he had won the lottery. Amazingly more than 50 years on, Joe Brown has never talked about the first ascent of Kangchenjunga, the world’s third highest mountain, apart from a brief cameo at the Alpine Club with other members of his team in 2005. So when I accepted Dan’s invitation to go to Joe Brown’s lecture at the Royal Geographical Society in London last week, I didn’t realise what a privileged evening I was in for. As you can see, I was very excited. The event was organised by Doug Scott in order raise funds for his charity Community Action Nepal. Among many other great ascents, he is perhaps best known for being the first Brit to climb Everest, by a new route on the Southwest Face in 1975. Only a mountaineer of his pedigree could have persuaded Joe Brown to break his silence. But we also had a pretty distinguished warm-up act. Two more survivors of the 1955 Kangchenjunga expedition are Norman Hardie and Tony Streather (rhymes with ‘weather’), who reached the summit the day after Joe Brown and George Band, and are both still alive. Norman Hardie lives in New Zealand and could not attend, but Tony Streather did and gave the introduction. Very frail and elderly now, and with failing eyesight, he was led to the stage by a friend, and gave a short and remarkably self-deprecating talk about an extraordinary life. Originally an army transport officer posted to the Chitral region of Pakistan, he started his Himalayan climbing career by providing logistics for big expeditions. He was never part of the climbing team for most of the expeditions he joined, but nearly always ended up climbing as high as everyone else. He described how he organised the expedition logistics for a Norwegian team climbing Tirich Mir, the highest mountain in the Hindu Kush mountain range. The Norwegians insisted on treating their Pakistani guides and porters as equals. This made them feel uncomfortable, so Tony was invited to join the climbing party because he behaved much more like a ‘sahib’ was supposed to behave. He ended up climbing all the way to the summit. Tony Streather also has the distinction of being on the most famous belay in mountaineering history. He organised the logistics for the 1953 American K2 expedition, and as usual ended up climbing as high as everyone else. Trapped high on the mountain for several days by a storm, the team of eight were retreating roped together in pairs when one of them fell, dragging his partner with him. The ropes became tangled together, and two by two, the entire team began plummeting to their deaths before Pete Schoening, who was descending at the back and saw what was happening, drove his ice axe into a crack and saved all of them. Still believing himself to be a transport officer, Tony described how he returned from this expedition and discovered he had suddenly become a distinguished Himalayan mountaineer. He was invited to join the Alpine Club, and later became its president. There was an interesting contrast between the two speakers. Tony Streather was very much a distinguished looking establishment figure who spoke with a very refined upper class accent which could have provided the voice-over for the old Pathé News archive films. He handed over to Joe Brown, a much more confident speaker, extremely sprightly for an 82-year-old, who spoke with a broad Lancastrian accent. He explained that he told Doug Scott he couldn’t possibly do the presentation because he didn’t have any pictures to illustrate it. A helpful relative of John Jackson, another member of 1955 expedition team, responded by providing over 200 archive photographs for him to choose from (and what incredible photos they turned out to be!). George Band’s widow Susan then provided his expedition diaries for Joe to read and remind himself of some of the events. These proved to be a treasure trove. George had documented things in meticulous detail: timings, locations, who did what, information about how their camps were set up, and even what they had to eat for dinner. There were even a few incidental details, and Joe read one of them out. As for the climb itself, Joe’s presentation and the photographs which illustrated it, were absolutely spellbinding. 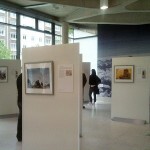 Much of what happened on the first ascent has been well documented. They climbed the Southwest Face at the head of the Yalung Valley using a base camp at a place called Pache’s Grave, where a climber called Alexis Pache, who died in an avalanche in 1905, was buried (see note *). At the upper end, they climbed a long snow ramp now known as The Gangway, which needed two camps. Setting out at 8.15am on May 25th, Joe and George wasted an hour and a half by diverting onto the Southwest Face too early and finding the rocks above too difficult. They returned to The Gangway and tried a higher line. After five hours of climbing they reached the West Ridge, but a little above this their way was barred by a tricky rock wall with vertical cracks 20 feet high and a slight overhang. Joe led the way up it, and at the top he discovered he was virtually on the summit. It was 2.45pm, fifteen minutes before their self-imposed turnaround time, and they refused to climb the last five feet to the literal summit because they had promised to respect the local belief that the summit was the abode of mountain gods. The following day Norman Hardie and Tony Streather used the same route up, but found a somewhat easier way onto the summit via a snow ramp onto the South Ridge, which they then followed to the top. These are the facts of the climb, but Joe’s talk provided many incidental details which evoked some of the emotions they must have experienced. 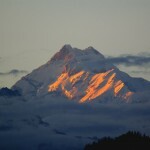 Kangchenjunga is a notoriously avalanche-prone mountain, and he described how George Band sat at base camp one morning counting the number of significant avalanches he heard roaring down the slopes around them. In the space of just three hours he counted 48. 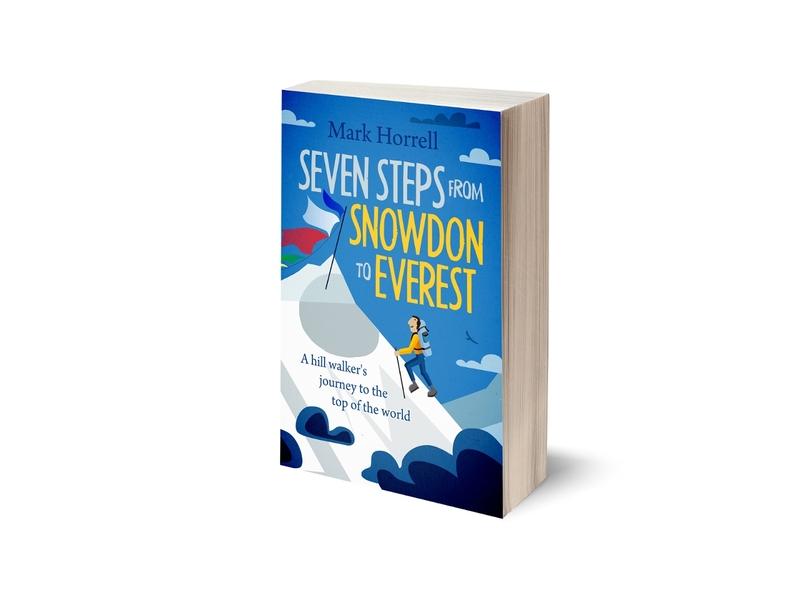 He described how Camp 2 was pitched at the top of a crevasse, and Himalayan novice that he was, he walked into the back of it to take a pee, only to realise he was standing on a patch of overhanging snow above the biggest yawning abyss he had ever seen. He tiptoed out again without daring to breathe. He and Charles Evans were descending from there one day when they saw a crack opening up below them. They ran back up again to avoid falling in, and arrived at the top of the slope more exhausted than they could ever imagine. Back at Camp 2 they felt trapped, knowing this new obstacle had appeared below them, and their morale was very low as they waited in their tent that afternoon. From really enjoying themselves, they suddenly felt like they were in a horror show. The following morning, wondering how on earth they were going to get down, they were surprised to hear voices outside their tent. Norman Hardie had come up with some of the Sherpas, and said a huge avalanche had cleared the slopes below them of any danger. A great feeling of relief washed over them. Climbing just below the summit of Kangchenjunga, close to the place Joe Brown called the world’s best picnic site. The peak behind is Yalung Kang (Photo: Anselm Murphy). On their summit push Joe gave us some insight into the character of George Band. Joe had taken five cigarettes up with him, and smoked them all inside their tiny 2-man tent at 8200m. “Imagine being up there, exhausted, and having to share a tent with somebody smoking? But George never said a word to me – he must have been the most tolerant man in the world!” When they reached the West Ridge they stopped for something to eat just 100 metres or so short of the summit. He showed us a photograph of himself sitting on the West Ridge with Kangchenjunga’s sister summit Yalung Kang rising up behind. “Now isn’t that the world’s best picnic site!” he said. When they got back to Camp 6 that night, Norman Hardie and Tony Streather were already in place for their summit attempt. Although George and Joe had intended to descend to Camp 5, Joe discovered he was snow blind, and it was obvious they could go no further. Camp 6 was in a horrible location, pitched on a 45° snow slope close to some rocks to use as anchors a long way up the The Gangway. Climbers don’t use it these days, and start their summit days straight from Camp 5. The four of them shared the tiny 2-man tent, with George sleeping in the porch, and Joe on the ground between the two sleeping mats. “My eyes were agony and I kept rolling over all night,” Joe said. “I can’t believe anyone got a wink of sleep.” He said he was terrified as he was led down by George the following day, unable to see a thing. It took three days for his eyes to recover, but there was sadder news when they reached base camp and were told one of their Sherpas Pema Dorje, who had done essential load carries up to their higher camps, had died of altitude sickness. How very true, and perhaps this is one of the reasons why Joe Brown is such a survivor. It was certainly one of the best presentations I have ever been to. Not only was he funny, but he conjured up all the drama of the expedition in a very matter-of-fact way, never once resorting to hyperbole to overstate his point, as so many mountaineering writers and speakers do. It’s probably easier if you’re such a legend as he is, and the photographs certainly helped, but even so … It was a real privilege to be there, and if he ever decides to do another one, make sure you go. (Note *) Pache had been climbing with ‘The Great Beast 666’ Aleister Crowley, and Joe drily noted in his talk that, “Crowley might have been the Great Beast, but he obviously had good mountaineering sense.” On both his expeditions to K2 and Kangchenjunga, he chose the routes which the mountains were eventually first climbed by. Thanks, guys, glad you like the post. I had some great material this time – if only we had presentations as good as this in London every week! Such a daft implication that public school (i.e. private school) produces anyone better. That’s the type of elitist BS which really needs to change. Going to public school only means that these people were rich enough to not need to get a “proper” job immediately and be able to concentrate on climbing. Dave MacLeod didn’t go to public school, neither did Andy Kirkpatrick. I very much enjoyed your report on Joe’s presentation, his quotes bring life to the article and it looks like age has not affected his manner of speech! Thanks for the info on Tony Streather, an accidental hero, who became the Alpine Club President. 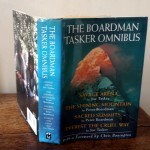 While reading this I was transported to the black and white era of mountaineering. I’m sure you’ll have a wonderful time trekking, best wishes.